The Voltbike Elegant was introduced to the Voltbike line a few years back. The new Voltbike Elegant has only the name in common with the original and it has gone through a complete makeover. The price has gone up by $200 but the new Voltbike Elegant is a much better bike than the original. It has improved front shocks and a new 6061 frame. The Elegant now has a more powerful Bafang rear hub motor and the battery has been mounted lower in the frame for a much better ride. The overall look is a modern better, looking bike. 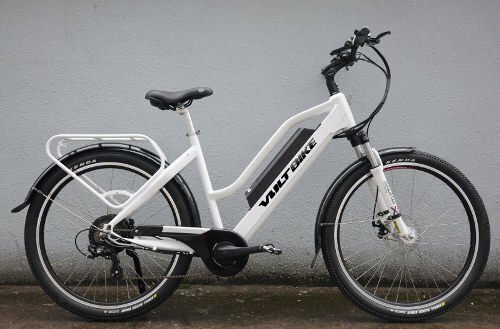 The Voltbike Elegant is an ideal city cruiser with a step-through design to make it easy to get on and off. This makes the Elegant easily accessible for smaller riders and people with physical limitations, great for ladies and older people. This is one of the lighter E-bikes on the market with a very reasonable price point. The Elegant is an E-bike to consider if you are thinking of buying. 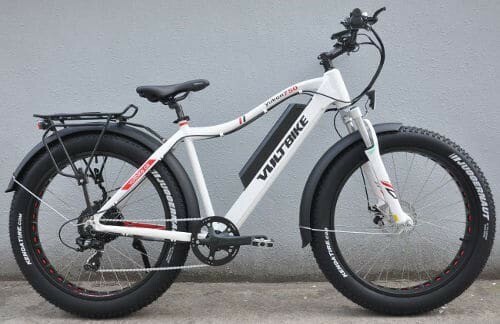 If you do some shopping around you will soon find the Voltbike Elegant is one of the better value E-bikes on the market and in keeping with the companies philosophy. "It all started in our garage with a mission. To bring North America premium electric bike at half the price compared to your local department store." It is not as rugged a the Yukon E-bike series but a very solid bike none the less. 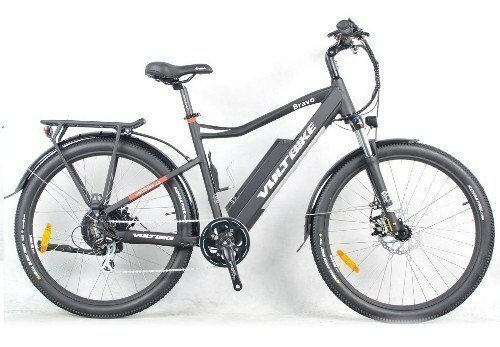 The Voltbike Elegant E-bike is ideal for a lady that wants a full-size E-bike but not the big fat tires like on the Yukon series. As you can see the new Voltbike Elegant is a much better looking E-bike and has a more rigid frame than the original frame. 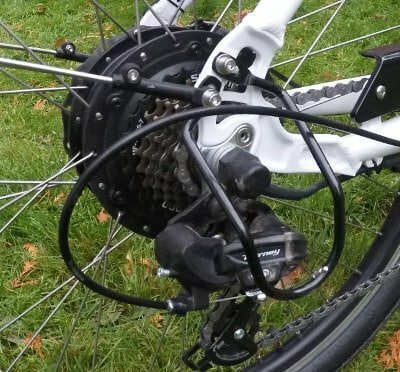 This gives the bike a more solid reassuring feel and with the battery now located lower on the frame, which lowers the centre of gravity, and gives the bike better balance. After ordering the Elegant it took about six weeks from order date to deliver. As with all their E-bikes, the Voltbike Elegant arrives at your door 90% percent assembled. All you have to do is put the handlebars on and the pedals. Note: There is a left and right pedal. It takes about a half hour and you are ready to ride. Unfortunately, unlike the Yukon the Elegant arrived with a little shipping damage. 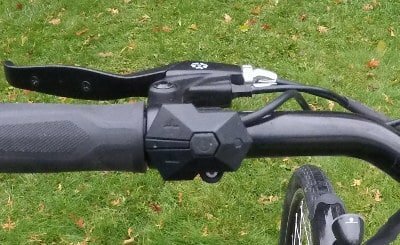 The plastic mounting bracket on the handlebar for the digital display was broken. The owner emailed Voltbike and so far has not heard back from them. That is why I think you have to call to get things done. I do believe they are often get overwhelmed with emails and they get lost in the shuffle. My first impressions is that I really like the look of the Elegant. Especially in white. It is a relatively light bike, weighing 55 lbs. It covers all the bases and more with front suspension and front and back lights and fenders. The sleek modern frame gives it a nice modern look. The step-through design makes it easy to get on and off and the overall balance of the bike is very good. The new 6011 aluminum frame gives the Elegant a nice solid feel. The Elegant feels fairly light and feels like a regular bike but the powerful 500 watt rear hub motor gives it plenty of pep. I found the Elegant has faster acceleration than the Yukon 750 but the acceleration does not feel as smooth. I weigh 200 lbs and the Elegant jumps to speed very fast, it can almost get away from you. Whereas the Yukon has a smoother acceleration. This could possible be improved with a software adjustment. The Elegant does not feel as substantial as the Yukon but this may be just what you are looking for. It weighs a full 13 lbs less making it much easier to move around. If you remove the 7 lbs battery it brings the weight down to 48 lbs. 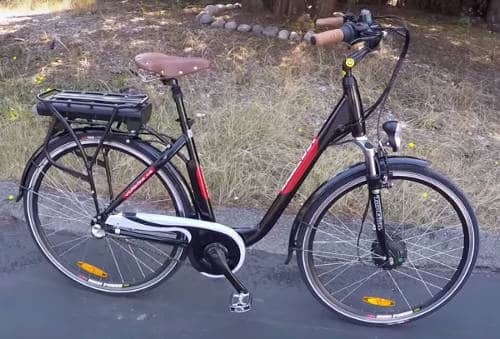 This E-bike is an ideal city cruiser for a woman or older person that can appreciate the step over design and manageable weight. The build quality on the Elegant is very good. Keep in mind Voltbike wanted to make a good E-bike, but keep it at a lower price point. Some parts are entry level but the important things like the 6011 frame, 48-volt battery, and Bafang motor are top notch. It does have good entry level hydraulic front forks. Many E-bikes in this price range do not provide this. Tires are a basic Kenda 26". This is a great bike to start with and over the years, as you put miles on it, you can upgrade a few components. The Elegant is a quality built E-bike with a number of extra features that are quite surprising for the price point. The new Elegant is basically unrecognizable from the original Elegant. First off the frame on the new Elegant has been upgraded to a 6061 aluminum alloy that is the same frame used on more expensive bikes and is a big improvement from the old frame. The new frame is a much more ridged solid frame it is a very comfortable design that is relatively light. The look of the new frame is a much more modern style than the old frame. I think it looks really sharp in white. There is only only one frame size (around 19 inches) but you have a choice of colors: black or white. I like the black look on the Yukon but I think the white on the Elegant looks really sharp. 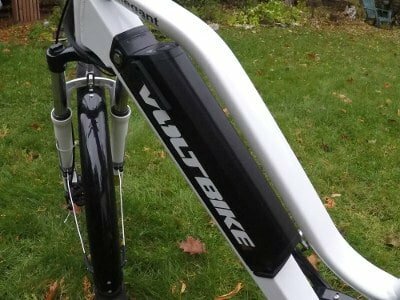 The Voltbike Elegant is a well-built bike with good quality components. Keeping in mind the manufacturer wanted to keep the price down they did have to make some compromises on the quality of some components. They did seem to choose better parts for more important components like a Bafang motor and Samsung battery. Both are becoming the industry standard. The original front hub 250 Watt 8Fun motor has been moved to the rear and been replaced by a Bafang 500 watt motor with a peak of 750 watts. This help gives the new Elegant more power and better handling and traction in a wider variety of conditions. This motor has plenty of pep and will get you up to speeds of 25 miles per hour. The handlebars on the new Elegant have been upgraded to Promax Alloy, Low-Rise, 630 mm Length handlebars and an adjustable alloy stem Promax MA-579 with 110mm extension. Adjustable angles 90° - 160°. This gives you more adjustment option. For example, adjust the handlebars forward or back for a more relaxed ride. The pedal assist controller located on the left side has nine peddle assist modes that adjust the amount of assistance. The higher the number, the more peddle assistance you get. It has Cadence Sensing Pedal Assist with 12 Magnet Disc. The controller is the same as on the Yukon. It works great, but it is made of plastic and a little fragile. The buttons can easily get broken off and is a part that may need to get replaced if you are not careful. The Elegant has the Tourney Shimano RD-TX35D 7 speed direct rear derailleur. Shimano's basic 7 speed derailler. This is Shimanos entry level derailler. It is protect by a guard that seems to be standard on most Voltbikes. It really is a good addition the the bike and does a nice job of protecting the derailleur if the bike falls over. The original Elegant had the battery mounted on the back and was only a 36-volt battery. The new Voltbike Elegant now is a 48 volt, 11.6Ah Samsung ICR18650-26F Cells Lithium-ion battery weighing 7 lbs. It is mounted on the new aluminum-alloy 6061 frame, lower down below the crossbar. This gives the bike a lower center of gravity and a much better feel when riding. A big improvement on the new Elegant are the brakes. The original brakes were band brakes and from customer feedback they did not work that great. The new Elegant has Tektro Novela MD-M311 front and rear mechanical disc brakes. These are basic disc brakes that require more hand strength to actuate than hydraulic: you have to press hard to stop. Hydraulic disk brakes would be a nice upgrade in future models. The Voltbike Elegant comes with Kendra 26" tires. They are an inexpensive basic tire that gets the job done and helps keep the overall bike cost down.I don't see less expensive tires as a big deal because E-bike riders generally put on more miles on their bikes and wear out components faster. This includes tires. This means that tires will wear out faster and you will have many opportunities to upgrade to better tires. The rims are 27 aluminum with 13G 209mm spokes in the rear and 13G 248mm spokes in the front. Safety feature. The Voltbike Elegant comes with a front light and a bright rear tail light that is mounted on the included rear rack. A decent light that is petty bright and will get you seen at night. The Elegant comes with front Suntour XCT DS suspension fork with preload adjuster. A good entry level suspension for mountain bikes. 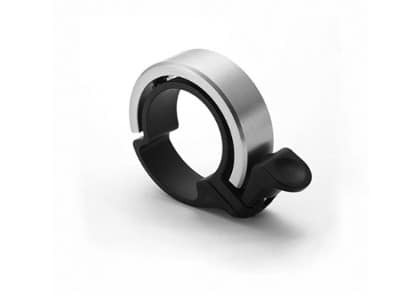 There is no compression or rebound adjust. Not the best suspension but many E-bikes in this price range have no suspension at all. 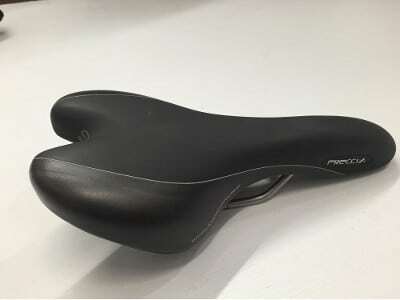 The seat that comes with the Voltbike Elegant is the Selle Royal Freccia. A good quality gel seat, but maybe a little bare boned for some. The owner of the Elegant E-bike that I am reviewing put on a larger more comfortable gel seat. Weather is not always sunny for commuters and a little rain must fall. The Voltbike Elegant comes with plastic fenders over the front and back wheels that protect you from water coming off the tires. No stripe down your back. The fenders are a shiny plastic that look really nice. But they do have a tendency to do a little buzzing when riding. An additional rack comes standard with the Elegant as well. The bell that comes with the Elegant is an aluminum alloy bell that is a little disappointing and not as nice as what comes on the Yukon. It is not very loud and kind of cheap. The owner of the bike I reviewed replaced it with another bell. Another nice touch is the chain guard that protects your dress or long pants from getting soiled by the chain but it does have a tendency to rattle. As with the Yukon, the Elegant comes with a nice solid kickstand. The screw setup is a little different than on the Yukon. I think this is better than on the Yukon and does not vibrate loose as easily. This is an area you might want to include in your daily check. See ABC Check List. 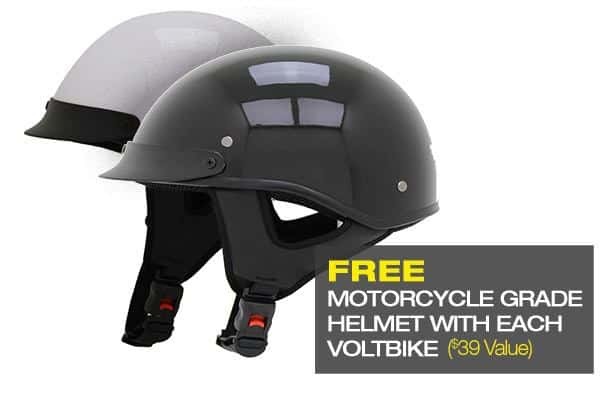 With every E-bike you buy from Voltbike, they include a free motorcycle grade helmet. So you are ready to go riding when your new bike arrives. Your choice of black or white. You must wear a DOT approved helmet to operate an E-bike on the streets and it's a great idea to have a good helmet on when off-roading. Range around 20 to 25 miles (32 to 40 km) per charge. Stem Adjustable stem Promax MA-579 with extension 110mm. Adjustable angles 90° - 160°. Aluminum alloy. Some components can be improved. The bell that comes with the bike is not very good. I do like the Voltbike Elegant and for its price point, I think it is a great bike for a daily commuter. If you want a smaller lighter E-bike for a reasonable price stick with the Elegant and you will be very satisfied, but if you want something with a more solid feel, the Yukon limited edition in the 17-inch frame size can accommodate a smaller person 5'3 to 5'9. It is a bike weighing a full 16 lbs more than the Elegant but for $300 more the Yukon Limited Edition is to me a better value and a better bike. The Yukon has many more upgrades that are included and it has a very solid feel. The fat tires also are more forgiving on bad roads and overall it is a more versatile E-bike. 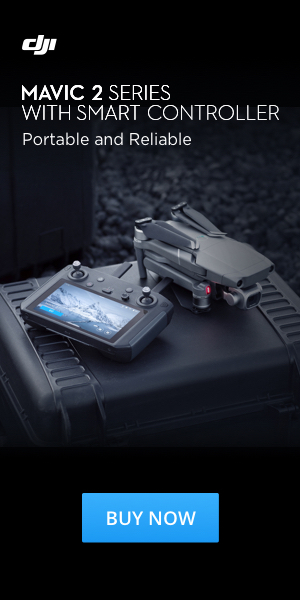 The new Bravo, weighing in at 58 lbs, is also worth considering. It is a lighter version of the Yukon with only a 500-watt motor and smaller tires, but it offers a longer range so you can go further with your E-bike. The Bravo on sale for $1699 has better components than the Elegant for the same price. The Bravo also comes in black or white but only available in one frame size at the moment. 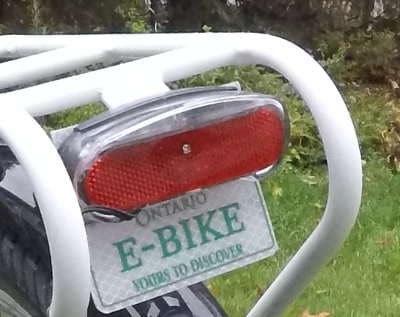 Are you going to use your E-bike often? If not, I would just buy a regular bike. E-bikes like to be used and not sit around forever. It's not so much the bike, but the battery that you will most likely have to replace sooner. A good battery can cost as much as a reasonable quality standard bike. 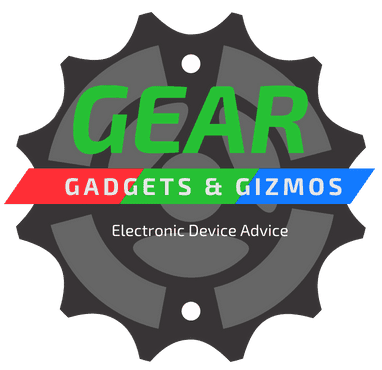 Here is another post that can help you learn about battery care. 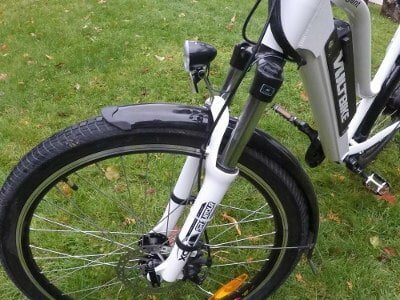 The Voltbike Elegant is a good entry level E-bike it has all the bases covered and overall is an excellent E-bike. Some components could be better but I imagine, as with their other bikes, they will be making improvements with each new model and stay in a budget. The bike is a good value for the money and a good base to start with. As you put on miles over the next few years and have to repair and replace components, it will be easy to upgrade and add a few higher end components. But in the meantime it would be a great bike for a daily commuter or older person to get around. The Elegant has plenty of speed and is fun to ride. 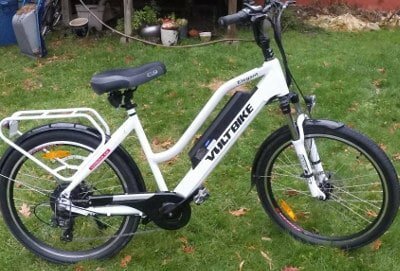 If you are going to purchase the Voltbike Elegant please fill in the name "Pete Lautenschlager" in the box that says Enter name of person who referred you to us. 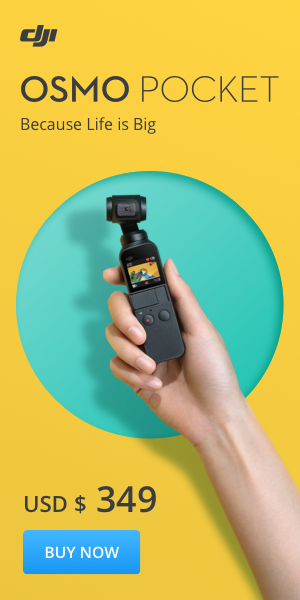 This will help out this website and allow me to make more helpful videos. Thanks Pete.